The gap between the richest and poorest in the UK has narrowed, the latest official figures show, but both are paying more in some taxes. Income equality narrowed between 2010-11 and 2011-12, the Office for National Statistics (ONS) said, which means this data does not cover the latest changes to benefits. Average household disposable income has reduced since the start of the economic downturn in 2007-08, the ONS said. It fell by £1,200 in real terms. The largest fall during this period was a 6.8% drop for the richest fifth of households. 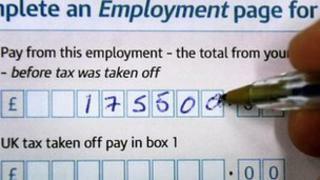 They still had an average income, before tax and benefits, of £78,000 in 2011-12. This was 14 times greater than the poorest fifth of households, who had an average income of £5,400. However, this group has seen their average income rise by 6.9% since the economic downturn. After all taxes and benefits were taken into account, the top fifth of households had an income of £57,300, compared with £15,800 for the poorest fifth - a ratio of four-to-one. All groups paid more indirect taxes in 2011-12 compared with the previous two years. This was the result of a rise in the standard rate of VAT in 2010 and 2011. On average, the richest 40% of households paid more in taxes than they received in benefits, while other households received more in benefits than they paid in taxes.